There is only one Judge Boyd Bunnell, one Gibby and one 75th anniversary of Utah State University Eastern. The college celebrated its Diamond Jubilee Oct. 21-28 with plays, presentations, talks, concerts, luncheons, authors, art, awards and athletic competition. For those fortunate enough to hear the retired Seventh District Court judge speak at the school’s anniversary luncheon on Oct. 24, they learned, first-hand, about the origin of Gibby. Bunnell, one of the first students of the college, talked about his role in the hauling of the hefty rock 74 years ago from a nearby lot where Carbon High School stands today. He joked about being ditched by his older brother, Louis, who forgot he had a heavy date that night, as he described it, and asked him if he would take on the weighty task in his place. He agreed to do it and later around midnight, with the help of a few classmates, he chained and lifted the ancient boulder from its resting place; but not easily. The trusty truck initially reared up against the weight of the stubborn stone until some of his more substantial classmates were able to eventually bring the front tires back to earth by standing on the front bumper. With sketchy traction, it was slow going as they zigged and zagged their way to campus. He talked about the initial tepid reaction to the rock by administrators. 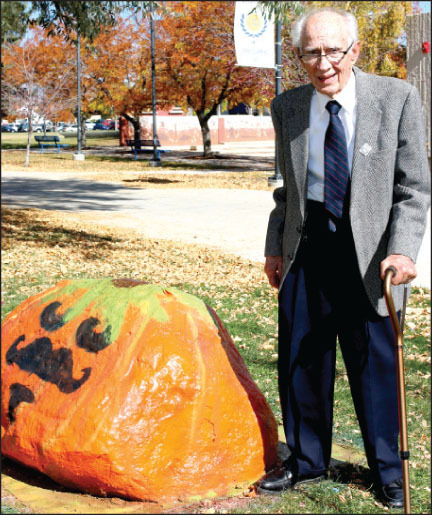 He described the various campus locations of the boulder that led to its present place outside the student center. He said the painting of the rock initially began as a reward to winners of tug-o-wars and other battles between the freshman and sophomores that usually regressed into a mud fight. Today, he said, anyone can paint the rock at any time, noting that he’s seen it change two or three times over the past two weeks alone. He talked about the rock art that adorns the cliffs of nearby canyons, noting how timeless it is and how Gibby is a lot like that. And after all of these years, he said, it still serves a purpose. Exactly what that purpose is may be open to as many interpretations as the thousand layers of paint that coat it, but who knows, he said, maybe one day a world-renowned artist can claim the rock as his or her very first canvas. Few would disagree that rocks have special meaning in Carbon County. For the region’s rich mining heritage, rock is a means to an end when mining the coal from deep within. And thanks, in part, to Bunnell, one bold little boulder has become a means of communication and recollection. In one form or another, that ordinary rock continues to help students, faculty, friends and others express themselves in uncommon ways and celebrate innumerable milestones. The messages they paint on its surface come and go. But despite the fleeting lives of the messengers, Gibby steadfastly remains, solid as Gibraltar, its namesake. There is comfort in that and will likely be just as reassuring to those toasting the college’s 100th anniversary in 25 short years from now.